The ultimate one-club player, and with one of the biggest hearts in football, Jamie Carragher was Mr Liverpool during his Anfield career. Our former vice-captain was instrumental in the Reds' success over the 17 years he represented the club, during which he made more than 700 appearances. One of the heroes of Istanbul, it's hard to imagine that famous comeback occurring without him. His Liverpool journey began back in October 1996 when he signed professional terms following a successful apprenticeship. The youngster had already represented England U21s, and earlier that year was part of Liverpool's first FA Youth Cup winning team alongside Michael Owen and David Thompson. Carragher's debut came at Middlesbrough on January 8, 1997, when he was brought on for Rob Jones in the Coca-Cola Cup. Roy Evans handed him a first start in a Premiership clash with Aston Villa on January 18, 1998. Remarkably, he marked his full debut with a rare goal. His passion, enthusiasm and versatility soon ensured regular starts, whether at right-back, left-back, centre-half or defensive midfield. Such adaptability also earned him an England call-up, with Kevin Keegan dishing out a first cap against Hungary in April 1999. This substitute appearance didn't put an end to his U21 career, however, and he went on to play 27 times at this level - a record which has since been broken. Carragher was an integral part of Gerard Houllier's treble-winning side of 2001, playing 58 games, most of which were at left-back. Sadly, like teammate Steven Gerrard, injury ruled the Bootle-born star out of the 2002 World Cup, and there was more heartbreak a year later when a fierce tackle from Blackburn's Lucas Neill at Ewood Park forced him to miss six months of the 2003-04 campaign. Despite this, he was part of the England squad for the 2004 European Championships in Portugal. Disappointingly, he played no part, but the following season was to be a career-defining one for Liverpool's No.23. While Carragher had always been a first-team regular at Anfield, he'd somehow struggled to get the recognition he deserved. Each new signing was seen as a threat to his place, and the Kop had yet to reveal its dream of a team of Carraghers. The arrival of new boss Rafael Benitez changed all this, with the Scouser getting the permanent centre-back slot he'd always craved. 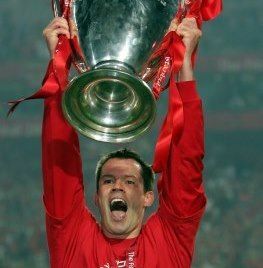 Carragher was soon being labelled the most underrated defender in the country, not least for his heroics in helping the Reds win the 2005 Champions League. One of the most iconic images from the club's glorious night in Istanbul is that of him collapsing with cramp after yet another last-ditch interception. He and Sami Hyypia had formed one of the tightest defensive partnerships in Europe, and it came as no surprise when he was voted Liverpoolfc.tv's Player of the Year. In July 2005, the defender signed a new four-year deal at Anfield. His loyalty was rewarded a month later when, in the absence of the injured Gerrard, Carragher lifted the European Super Cup following victory over CSKA Moscow in Monte Carlo. There was more silverware at the end of the season despite a 21st minute own goal in the FA Cup final against West Ham. It was the local hero's 10th final in as many years - and what better way to prepare for the World Cup. By now, Carragher was a regular in Sven Goran Eriksson's squad, and he played three games in Germany 2006, including a starting role against Sweden in place of the injured Gary Neville. The competition ended cruelly, however, when he missed a penalty in the quarter-final shoot-out against Portugal. Frank Lampard and Gerrard did the same, and England were out. At least he had the consolation of being voted seventh in Liverpoolfc.tv's 100 Players Who Shook The Kop series, beating the likes of Alan Hansen, Phil Thompson and Emlyn Hughes to be the highest placed defender. In August 2006, Carragher wore the captain's armband in the Community Shield against champions Chelsea, jointly holding the silver dish aloft with injured skipper Gerrard. The ensuing season included yet more milestones for the now Liverpool veteran. In December he scored his first league goal of the century against Fulham, taking his overall tally to four. Five months later, in the Champions League semi-final second leg against Chelsea, he broke Ian Callaghan's club record of 89 European appearances. Unsurprisingly, Carragher again committed his future to the Reds in the close season by signing another four-year contract. The summer of 2007 also saw him retire from international football following continued frustration at a lack of opportunities - though it was a decision that would be revisited a few years down the line. Concentrating solely on club football certainly did his form no harm and six months later he became only the 12th player to make 500 appearances for Liverpool. Carragher walked out to a guard of honour which included boss Benitez when Luton visited Anfield on January 15, 2008. The centre-half was also made captain for the night at the request of Stevie G.
As if all this wasn't enough, he then wrote a new page in Kop history by becoming the first player to represent the Reds 100 times in continental competition. Fittingly, the milestone was reached in one of Europe's top arenas, the San Siro, as Rafa's Redmen dumped Inter Milan, the runaway leaders of Serie A, out of the Champions League. The 2008-09 campaign saw Carragher get closer than ever to Premier League glory as Liverpool chased Manchester United until the penultimate weekend - but a title-winners' medal continued to elude a player now in his 30s. Sadly, the club could not push on the following season, finishing seventh and failing to secure a Champions League place. Eager to cram in as much top-level football as possible, the stalwart accepted Fabio Capello's invitation to temporarily come out of international exile for the 2010 World Cup. Carragher featured twice in South Africa before England's last 16 exit at the hands of old enemy Germany. He would continue to climb Liverpool's appearance table over the following seasons, though for the first time in his senior career he would find himself on the bench as often as the starting 11 during 2011-12 due to the form of Martin Skrtel and Daniel Agger. Indeed, Carragher had to settle for a substitute appearance as Kenny Dalglish oversaw a Carling Cup final win over Cardiff City in 2012. The following pre-season saw him make his 700th appearance in a Europa League qualifier against Gomel in Belarus, with Gerrard again handing him the armband for the night. Sadly for Liverpool fans, Carragher announced in February 2013 that there would be no more pre-seasons for him, as he confirmed that he would retire at the end of 2012-13. His final game for the club, his 737th, came against Queens Park Rangers at Anfield on May 19, 2013 - with the home crowd sending Carragher away with a standing ovation when he was withdrawn five minutes before full-time. Off the field, Carragher gives back to the city he loves through the 23 Foundation. Visit www.jamiecarragher.org to find out how you can help disadvantaged children in Merseyside and beyond.